The 'Qorichacra' project focuses on the critical topic of linking smallholders into sophisticated supply chains. It started in 2010 in the region of Cusco, Peru. We scaled it up with McDonald's and other partners in Peru, Brazil, Argentina and Puerto Rico. In 2018, a Master's student examined what happened after we had handed over this initiative. Here are her story and thesis. Here's the summary of the 2016 impact study. 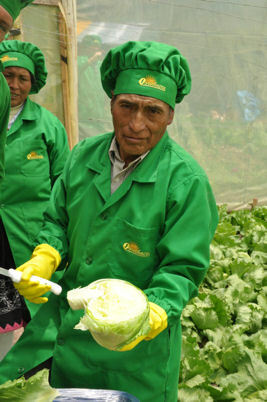 The project supports vegetable producers through infrastructure development, agronomy, GlobalGAP compliance and finance. It aims to enable them to access 'high-end' markets in the hospitality industry and retail. Another feature of this project is the livelihood improvement scheme. Specific initiatives help villagers to address particular aspects of their livelihood collectively. In Cusco, for example, farming families refurbished their houses and made other changes to their lifestyle. This scheme ran as a friendly competition. Qorichacra (meaning 'golden field' in the Andean language of Quecha) represents an innovative partnership between private and public organizations to help smallholders access high-value markets. The project is supported by the Syngenta Foundation and by Arcos Dorados, who run McDonald’s operations in Latin America. Local implementation is the responsibility of local teams, often from non-profit organizations with extensive experience in rural areas. 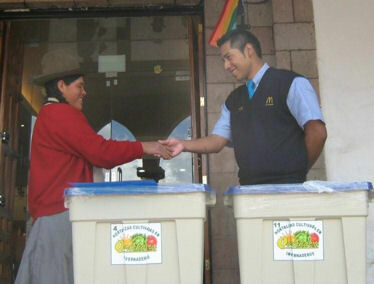 Producers’ network fulfilling the needs of McDonald’s and other restaurants in the cities of Cusco and Arequipa, Peru. Launch of Qorichacra Brazil, Argentina (2013) and Puerto Rico (2014), with the support of further partners. Here is a 2016 article in Spanish about the work in Puerto Rico, with similar information also available in English. In September 2015, the IIED issued a study called Global or local food chains? The publication focuses on Peru and Senegal, with inputs from our Qorichacra team. In 2015, together with a major partner, we started a newsletter in Spanish and Portuguese. We also have a Spanish brochure plus versions in Portuguese and English. In August 2014, McDonald's included Qorichacra in its review "Global Best of Green"
In July 2014, we extended this model to Puerto Rico. Here's the media release (in Spanish). We also have a short 2015 Qorichacra (Peru) video available in Spanish. If you would like to watch this, please send a mail to our contact box.